Roth & Scholl represents a broad spectrum of property owners, landlords, asset managers, property managers, and tenants, handling in all facets relating to the acquisition, ownership, operation and disposition of real estate. We handle both transactional work and litigation on a wide range of matters, including such areas as drafting and negotiating purchase and sale contracts and leases, enforcing remedies and rights under leases, covenants to maintain and repair the premises, landlord's liens and security interests, leases expirations and terminations, and force majeure clauses. We have extensive experience advising both landlords and tenants, from big box retailers to REITS, to owners of office buildings, shopping centers, industrial properties and mixed use properties. Our firm provides critical pre-dispute guidance, which may maximize the strength of the client's case should litigation later arise. Our firm also explores alternative ways to resolve disputes, such as pre-suit mediation, to allow the parties to structure a negotiated settlement or potentially salvage the relationship. When litigation is required, our lawyers know the issues and have the background and experience to effectively represent our clients. 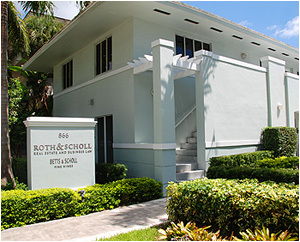 Roth & Scholl represents clients in a wide variety of complex commercial disputes in federal and state courts and arbitration panels throughout the state of Florida. Cases that have been litigated and often tried by our firm involve technology disputes, aviation matters, fraud claims, commercial and residential foreclosures, contract enforcement and interpretation, construction disputes, unfair trade practice matters, and corporate and partnership disputes. Roth & Scholl is actively engaged in collection matters on behalf of individuals, corporations and institutions. Its litigation attorneys handle matters pertaining to prejudgment remedies, asset recovery and collections in state, federal and bankruptcy courts.